You are invited to attend the highly anticipated Fraud and Financial Crime USA Congress. Across two days network and learn from like-minded industry professionals as they cover some of the most current and fundamental topics including global regulatory alignment, intelligence, cyber risk, risk assessment, beneficial ownership, cryptocurrency, biometrics and authentication, banking marijuana, sanctions and much more. 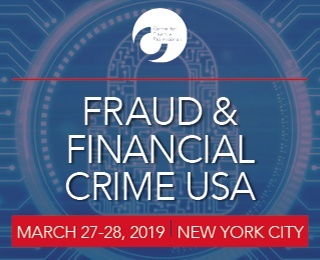 Hear from fraud and financial crime experts including Federal Bureau of Investigation | The First National Bank of Long Island | State Street | TIAA Financial Services | Metropolitan Commercial Bank | HSBC | TD Bank | Wells Fargo | Goldman and Sachs | and many more. Click here to view the full agenda and speaker line-up. Take advantage of our group rates: The current rate allows every third colleague to come along for half price or a fifth colleague to attend for FREE.